Powers/Abilities: He is both a sadist (enjoys inflicting pain) and a masochist (enjoys receiving pain). He is skilled with various firearms and bladed weapons. He wears barbed wire around his neck, wrists, and sometimes around his fists. One of his chief tactics is to intimidate others with how much pain he can take and inflict, so that they will decide not to fight him at all. If someone calls his bluff and shoots him, he's usually out of tricks. Height: 5' 11" Weight: 205 lbs. History: Little is known of Mondo Pain's past. (Punisher II#85) - Mondo Pain was hired by Ballard (heir to a dynasty of lumber and bootleg liquor) to steal his own merchandise so he could gain the insurance money, then smuggle the merchandise into China and sell it again there. Pain brutally slew one of Ballard's security agents when he discovered the theft. Ballard criticized Pain because he had instructed him not to kill, and now he had to pay the man's benefits. Pain told that's just the way he works, and when Ballard told his men to bury Pain, he intimidated them into standing down by telling them what he would do to them if they failed to kill him on the first shot. Pain then put out his cigarette on Ballard's face and walked away. 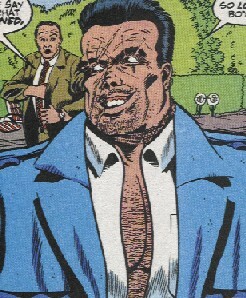 Agents of VIGIL knew that the Punisher was stalking Ballard, and they were hoping to use Ballard to get to the Punisher. A pair of agents tried to pull Pain over when he left Ballard's estate. Pain swung open his car door and took out the first's agent's motorcycle, but the other agent, Blackwell, leapt into his car and forced him to stop. Pain challenged Blackwell to try to beat the information out of him, and when Blackwell battered him savagely, Pain gained respect for him and happily volunteered anything he wanted to know. However, Castle then contacted both Ballard and Blackwell, informing them that each knew the other's plans and that Mondo had duped them both. Ballard tried to ship early and VIGIL confronted him in mid-transport. As soon as Blackwell joined the fray, Pain broke free from the other VIGIL agent and prepared to escape. When the Punisher confronted him, Pain tried his standard bluff: "You going to shoot me? Lot's of people have tried, Punisher. They died slow and not very pretty. Think twice. Don't miss. What are you waiting for? Shoot!" And so the Punisher shot him. Pain, his feelings and ego hurting him more than the chest wound, fell off of a bridge and Castle left him for dead. (Punisher War Journal#73) - Having survived the gunshot, Mondo Pain was hired by Rosalie Carbone to painfully dispose of the Lady Punisher, Lynn Michaels. (Punisher War Journal#74) - Pain was intercepted by Zafiro, who convinced him that he could still take out Michaels while working with him as well. Pain and his men (or Zafiro's or Carbone's men) tracked down Michaels and Officer Bendix, but as Pain didn't want them dead to quickly, he cold-cocked one of his men who fired on them. Lynn took advantage of his distraction to smash Pain across the face with a board. Fired up by the rush of the struggle, Pain broke the neck of one of his own men and then aimed his gun at Bendix. Michaels shot Pain in the arm, which really annoyed him, because he hadn't even gotten to do his bit yet. Tasting his own blood, Pain then shot Bendix in the leg and tackled Michaels. She broke free from him by biting and ripping out one of his earrings, and she fled into the sewers. When he follower her, she attacked him savagely, but he just got back up, complemented her style, and began shooting at her. (Punisher War Journal#75) - The police heard the shots fired and confronted the two, but Pain just turned his gun on them. Lynn tackled and disarmed him, but then the cops fired on the two of them. In the confusion, Lynn and Pain each escaped separately, and Pain found a copy of the Punisher's War Journal. After reading it, he called Rosalie Carbone and told her that Michaels had escaped him, but that he'd be willing to negotiate for the sale of the War Journal. As it contained info on Rosalie's affair with Castle, he knew she'd be willing to pay to keep it out of others' hands. Comments: Created by Steven Grant and Hugh Haynes. Mondo - mutant, agent of Black Tom Cassidy, former captive of Hellfire Club, held by Shinobi Shaw, who planned to sell him to Cordelia Frost, abducted by Cassidy in guise of Barrington, trained by Cassidy. PAINGLOSS - Biphasia, warrior, former servant of Sardanus, slew Glissem, fell in love with Halfqueen, turned against and slew Sardanus.